Will One Bad Book Ruin Your Career? Back in the early days of sound movies, a handsome but unknown actor caught a huge break. He was cast as the lead in a sprawling Western epic under the helm of a well-known director. The studio began grooming the kid for stardom. The only place he could go after that was “Poverty Row.” These were low-rent studios churning out B and C grade pictures, most of them real stinkers. Here the actor labored for years. In 1937 this actor made yet another B Western, Born to the West. I watched the film recently. It is, without doubt, one of the worst movies I’ve ever seen. And the actor? A bit stiff and prone to goofy smiles. So add another floperoo to this guy’s resume. No way the actor, Marion Morrison, was ever going to be a star. Perhaps you know him better by his professional name, John Wayne. But did these bad films ruin his career? Not when the right role and director came along. 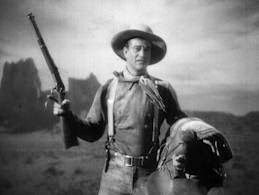 The role was the Ringo Kid in Stagecoach directed by the great John Ford in 1939. John Wayne knocked it out of the park. And in the course of the panel’s comments on self-publishing and how it can play into an author’s career, [agent Brandi] Bowles offered the opinion that if one self-publishes a book and it doesn’t do well in terms of sales, then some publishers might look askance at that disappointment if asked to consider publishing that author. Bowles is joined by others in the more traditional corridors of the industry! the industry! in suggesting that if there’s a chance that self-publishing could make an author appear to be “damaged goods” to a publisher, then self-publication is, at least, a very serious option, a route not to be taken lightly. This sparked outrage from at least one self-publishing attendee, who turned a mealtime with Porter into a persistent pronouncement of publishing pique. So let’s step back and analyze. In those same old days, the only option after such failure was to go to publishing’s Poverty Row, smaller companies with fewer dollars and less distribution. Or the writer could give up the dream entirely. Getting another shot a the “big time” was usually out of the question. I believe this is the context in which the agent made the above statement. But that context has now been significantly altered. First of all, the term career no longer applies only to getting published by a big, traditional company. Purely self-publishing careers are being established on an ever-increasing basis. But let’s assume your dream is getting signed by one of the Big 5. If you self-publish a book, and it doesn’t sell a lot, you are still making readers. If the book gets good reviews, you are making a reputation. That’s all to the good. If, on the other hand, your book gets hammered, you can always take it down. You can come back and try again. And again. Just like John Wayne. Then, should you come up with a killer concept and you have continued to work on your writing chops, your self-publishing credits will not be a deal-breaker. Traditional publishers know (at least the ones who will survive know) that their distribution and marketing systems are different and can be exploited anew for the author who has learned his trade in the trenches. This entry was posted in John Wayne, self-publishing, writing career by Joe Moore. Bookmark the permalink. Great post, as usual, Jim. Of course, Brandi Bowles is still laboring under the tired myth that self-published writers all secretly want to be traditionally published, ergo, they would never do anything (such as risk low sales on a self-pubbed book) to torpedo that ambition. Right, Mike. Myths have some basis in fact, but eventually they become a window to the past, not the future. All that advice also applies if you’re only going to write one book; another concept I just don’t get. One bad book does not typically ruin the career of any writer who keeps writing and improving. That’s why pseudonyms are so cool. I, on the other hand, know for certain I will not have to worry about such a crippling blow. My cousin Leonard, the famous , red headed, big lipped, goggle wearing, time traveler, has assured me that in the future my name(s) are all assured to go down in history as most awesome writer of the ever. In the year 2094, thanks to the Personally Identifiable Phonetic Structure And DNA Logical Indentification Sequencing Project (PIPSADLISP) He personally made sure to register official name changes for my DNA as Joe Moore, Joe Hartlaub, James Scott Bell, John Gilstrap, John Miller, Steven King, Terry Pratchett, Neil Gaiman, Ken Follett, Jordan Dane, and Michelle Gagnon, and a bunch of others who had not claimed their names after their deaths. At any rate, there is a lot of popularity for all to be had via modern technology in the future. Time travel is worth every penny, isn’t it? Basil, I think you’re onto something (or should I say on something). We need to add a clause to our living wills to direct our families and attorneys to register for those additions to our names and DNA. Maybe Jim and Joe Hartlaub and the other attorneys among us could tell us how to do it. Will you be starting a directory where we can see what fame is still available? And by the way, what kind of mountain moon dew are you brewing up there in Alaska? Do you think it would help my creativity, too? On a serious note, all professional writers do need an estate plan that includes their rights being passed on as they desire. I have a living trust that does it for me. Well said, Jim. Things are definitely changing and I like options. Thanks for your post. That’s the nice thing about these times, writers do have options, real options. I note that eventually John Wayne had his own productions company! Thanks for the advice, Jim. Your encouragement each Sunday morning starts me out on the right track for a writing session – head down, nose to the grind stone, pour everything into it, and take the risk. Thanks, Coach. You’re quite welcome, Steve. I like your nod to the work ethic. That’s a non-negotiable. The thing that really excites me about self publishing, and I think most traditional publishers fail to see, is it’s now possible to once again build your career in the long tail. It used to be you publish book after book. Modest sales didn’t hurt you, because it was assumed that as you published more works, people would find out who you are. Usually around the third book (if your books grew increasingly better) sales would pick up enough that you would have this proven track record and your advances would increase. Not only that, but these books stayed in print for longer than a year or two. So the writer was able to live off the royalties as well as their advances. Now in traditional publishing, your backlist is non-existent or shrinking unless you’re Stephan King. It’s nearly impossible to get the track record publishers want you to have, because either your first book has to be a big hit, or you’re washed up. Digital tracking systems has also killed more careers since if your first book sells X number, the bookstore will order slightly less than that for your next book. It gives you an automatic negative sales record and unless you get lucky, you’re washed up. I know the above is a worst case scenario, and there are plenty of midlist traditionally published writers out there. But I’ve heard the same version of this horror day out of traditionally published writer’s mouths to be concerned. This is where self publishing is wonderful. Write a book that doesn’t do well in sales? Write another one. Keep putting books out there, and growing your name over time. Eventually sales will pick up and people will find your work. At that point, if you wish to seek traditional publication, I think you’ll be in a good position, having a healthy list of loyal readers. This is just my two cents. I’m still learning a lot about this business and continue to collect data. A fine analysis, Elizabeth. Spot on. I was definitely concerned about this when I decided to self publish my book. But now I’m not so worried. I’ve learned about taking risks, and the “long tail” of publishing. Time is short. Life is short. I’ve decided to enjoy myself by writing what I want to write, having awesome covers designed, paying a knock-out editor, and putting my work out there. Sounds to me like exactly the right formula, Julie. Especially the “time is short” part. I have so many stories I want to tell, short and long, and now I can. We all can. Traditional publishing will spot the successes and make offers. It’s happening now. Deals will be worked out with new paradigms. I noticed that too…not that if you want to traditionally publish, you should go self publish first, or that all self published people want that deal…but yeah, if someone is doing really well self publishing, they have agents and editors knocking on their door. It’s because they’ve already proven themselves successful, I think. I also think that if you’re self publishing, and you build your audience, and then decide to traditionally publish something, that it will help your trad. sales, because you already have a built in readership. Exactly right. You create readers, and that is now a recognizable plus. Compare that to a new writer approaching agents and publishers with no track record at all. This is a realization beginning to dawn. Great post, Jim. Love John Wayne too. Because of all the options in self-publishing I’m wondering if I can hurt my reputation by publishing non-fiction and other types of fiction different from what I typically do, including short stories, novellas, etc. I really don’t think it will hurt and might help in some instances. What are you seeing and hearing out there? I don’t live in fear of making mistakes but I do want to be wise. That is an unfounded fear, Jillian. The bottom line is write quality. Do that, and you can cross genres and forms, no problem. There will be readers who cross forms with you, too. There will also be those who stick with one type, and that’s just fine. There is no downside here, except this: dumping stuff out there that’s not ready. This has happened with a couple of A list writers. They put up crappy stories (or their marketing dept. did) which were little more than promos for books yet to come. Readers responded with scathing reviews. I daresay they lost some readers. Maybe when you have a million of them, that’s not a concern. But it does show a certain disrespect, and that I’m unwilling to do. I think it’s a decision everyone needs to make for themselves, depending on what you want out of your career. But personally, I feel like I’m in a better place to make those decisions once I’ve done my research. Pick up some good books on self publishing, and then figure out what you want out of your career. I have noticed a lot of people who self publish do publish across different genres, since this is one of the biggest boons self publishing has going for it (no editor telling you to stay in your brand). You still might “loose” readers who won’t touch your horror stuff, but love your cozy mysteries, but that’s part of publishing anyway. And depending on your schedule, you might be able to publish your work sooner and thus please both camps of your fans since they don’t have to wait every other year for you to publish a book in their preferred genre. Some excellent books are Jim’s “Self Publishing Attack!”, “Write. Publish. Repeat.” by Sean Platt and Johnny Truant, and “How to Market Your Book” by Joanna Penn. Nice post, Jim. My co-writer and I have decided that after 6 published novels, #7 will be sent out into the world by us. The print, ebook and audiobook will be our responsibility. If we fail, we have ourselves to blame. And if we succeed, then we alone take the victory lap. During one of our daily conference calls a few weeks back, we made the decision to indie publish. Once we both agreed, I felt a weight lifted from my shoulders–the weight of always depending on others to forward my career. It can be scary, but no one wins if there is no risk involved. Going the indie route can be summed up in one: freedom. Joe, you express exactly what it feels like to do this after being in only “one stream” for several years. I’m excited for you. “Scary” will soon enough turn into “exultation.” And the thing about being master of your own fate is huge. Good luck, and keep us posted. Am in the same boat, Joe. We weighed the pros and cons and decided it made more sense financially and for the health of our series to publish our next book ourselves, esp since our back list that we published is doing pretty darn good. But we are also working on a book that we are going to try to launch via traditional channels. At the Edgar events last week I talked to several agents and editors (of Big Six houses) whose opinions I value and to a one, they all said the old models were gone and that, as Jim said, the only thing that counts is quality storytelling, craft and, if you can manage to bring it to the table, a reader base. And yeah, it’s scary but what steps in life that are worth taking aren’t scary? Kris, good luck to you and Kelly. A note about agents and keeping them around: foreign rights. We have not released our latest thriller THE SHIELD yet. But our agent has already nailed us a 3-book print contract with a French publisher. Keep your feet in both “streams” as Jim calls them. Take advantage of all opportunities. Maybe you and PJ can talk at length some time about writing with a partner? Or point me to the posts where you’ve already done that if it exists and I just missed it? My very close writing friend and I are going to write a serial together and self publish it. We’re very similar in tastes, so I’m not worried about serious differences of opinion, but I did wonder how other authors handled the writing, editing, and judgement calls. This is great Joe thanks! These are good examples. A professional author never gives up, is versatile, and bounces back from bad reviews, etc. Writing is in the blood and isn’t something that can be easily stopped. If anything, burnout from marketing is more likely, especially if results aren’t measurable. Quite right, Nancy. The ability to “bounce back” is one of the paramount virtues of the successful author. There are plenty of knocks and setbacks. Keeping going is half the battle. Accepting the universal truth that no writer ever finishes his apprenticeship, I’m confident that I’m writing well. I’m also confident my self-published mystery “works.” But what is beyond me is the whole loony, feverish, not to say nightmarish aspect of self-directed marketing. It has nothing to do with what I’ve written, only to do with selling it. If this and this alone is enough for agents and mainstream publishers to judge me on, the future looks bleak. Actually, I don’t know that the marketing of one book is make or break. It can still be excellent, and that’s definitely a plus. There’s also more work to come. If the books are good, they are gathering readers, and that’s something, certainly better than no readers at all.